Christopher Carson, known among his friends as simply Kit Carson, was a Kentuckian by birth, having been born in December, 1809. Kentucky, was at the time of his birth, an almost pathless wilderness, rich with game, and along its river banks the grasses grew so luxuriant that it invited settlers to settle there and build homes out of the trees which grew in such profusion. Small gardens were cultivated where corn, beans, onions and a few other vegetables were raised, but families subsisted, for the most part, on game, with which the forests abound, and the lakes and rivers were alive with fish. Wild geese, ducks, turkeys, quail and pigeons swept through the air with perfect freedom. Deer, antelope, moose, beaver, wolves, catamount and even grizzly bear often visited the scene of the settler’s home, among whom was our friend, Kit Carson. Kit Carson had no education. There were no schools to attend other than the school of “trapping,” and he became a trapper, Indian guide, and interpreter. When Kit was a small boy his father moved, on foot, so history relates, to Missouri. At the time of the move; however, there was no state or even territory of Missouri. France had ceded to the United States the unexplored regions which were, in 1800, called Upper Louisiana. Kit’s father had a few white friends, trappers and hunters, but the Indians were numerous. Mr. Carson, together with the other white families, banded themselves together and built a large log house, fashioned as to be both a house and a fort, if occasion demanded them, to fortify against a possible foe. The building was one story high, having port holes through which the muzzles of rifles could be thrust. As additional precaution, they built palisades around the house. This house was built in what is now Howard County, Missouri north of the Missouri River. Christopher Carson, at fifteen years of age, had never been to school a day but, he was “one of the Four Hundred” equal to any man in his district. He was a fine marksman, excellent horseman, of strong character and sound judgment. His disposition was quiet, amiable and gentle. One of those boys who did things without boasting and did everything the best he could. At about this stage of his life, his father put him out as an apprentice to learn a trade. The trade he was to learn was that of a “saddler.” However, the boy languished under the confinement and did not take to the business. He was a hunter and trapper by training and nothing else would satisfy his nature. One night about two years later, when Kit was eighteen years old, a man who chanced to pass his father’s humble home, related his adventures. He told how much was to be earned by selling buffalo robes, buckskins, etc. at Santa Fe, New Mexico. He drew beautiful word pictures of wealth that could be attained in the great Spanish capital of New Mexico, more than a thousand miles from Missouri. Soon, several able-bodied men decided to equip some pack mules and go to the great bonanza. They intended to live on game which they would shoot on the way. Kit heard of the party and applied to them to let him accompany them. They were not only glad of his offer to go, but considered they had a great need for him because he was so “handy” among the Indians. It turned out that Kit engineered the whole party. He had a military demeanor. When the mules were brought up and their packs fastened upon their backs, which operation required both skill and labor, it was Kit who ordered the march, which was conducted with more than ordinary military precision. This suit that he was so proud of consisted of a hunting shirt of soft, pliable deer skin, ornamented with long fringes of buckskin dyed a bright vermillion or copperas. The trousers were made of the same material and ornamented with the same kind of fringes and porcupine quills of various colors. His cap was made of fur which could entirely cover his head, with “port holes” for his eyes and nose and mouth. The mouth must be free to hold his clay pipe filled with tobacco. It is needless to say that he wore moccasins upon his feet, beautified with many colored beads. 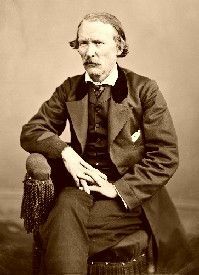 Prior to the year of 1860, I was not personally acquainted with Kit Carson, but after that year I knew him well. At Fort Union, New Mexico he was the center of attraction from the first of April, 1865 until April, 1866. Everyone wanted to hear Kit tell of exploits he had been in, and he could tell a story well. Kit loved to play cards and while he was as honest as the day was long he was usually a winner. He didn’t like to put up much money. If he didn’t have a good hand he would lay down. Kit Carson, like Colonel A.G. Boone, dealt honestly with the Indians, and Kit Carson had on several occasions told me that had Colonel A. G. Boone remained the Indian agent, if he had not been withdrawn by the government, the great war with the Indians would never have occurred. Kit Carson was a born leader of men and was known from Missouri to Santa Fe — he was one of the most widely known men on the frontier. Carson was the father of seven children. At the time of his death, his wife had already passed away in April, 1868. His disease was aneurism of the aorta. A tumor pressing on the pneumo-gastric nerves and trachea caused such frequent spasms of the bronchial tubes, which were exceedingly distressing. He died just short time later on May 23, 1868. His last words were addressed to his faithful doctor, H. R. Tilton, assistant surgeon of the United States Army, and were “Compadre adois” (dear friend, good bye). In his will, he left property to the value of $7,000 to his children. Kit Carson’s first wife was an Indian Cheyenne girl of unusual intelligence and beauty. They had one girl child. After her birth, the mother only lived a short time. This child was tenderly reared by Kit until she reached eight years, when he took her to St. Louis and liberally provided for all her wants. She received as good an education as St. Louis could afford and was introduced to the refining influences of polished society. She married a Californian and removed with him to his native state. The Indians of today  are possessed with the same ambitions as the whites. There are Indian lawyers, Indian doctors, Indian school teachers and other educators, but in the frontier days when from Leavenworth, Kansas, to Santa Fe the plains were thronged with Indians they were looked upon as uncivilized and were uncivilized, but were so badly abused, run out of their homes and were given no chances to become civilized or to learn any arts. The Indians around Maxwell’s ranch were mostly a lazy crowd because they had nothing to do. Maxwell fed them, gave them some work, gave the women considerable work — they wove blankets with a skill that cannot be surpassed by artists of today. Not only were these Indian women fine weavers, but they worked unceasingly on fine buckskin (they tanned their own hides), garments, beading them, embroidering them, working all kinds of profiles such as the profile of an Indian chief or brave, animals of all kinds were beaded or embroidered into the clothes they made for the chiefs of their tribes. These suits were often sold to foreigners to take east as a souvenir and they would sell them for the small sum of $200 to $300. Those Indian women would braid fine bridle reins of white, black and sorrel horse hair for their chiefs and for sale to the white men. The Indian women were always busy but liked to see a horse race as well as their superior—­their chief. An Indian woman is an excellent mother. While she cannot be classed as indulgent she certainly desires to train her child to endure hardships if they are called upon to endure them. She trains the little papoose to take to the cold water, not for the cleansing qualities, but for the “hardiness” she thinks it gives him. By William H. Ryus, 1913. Compiled and edited by Kathy Weiser/Legends of America, updated July, 2017. About the Author: Excerpted from the book, The Second William Penn – A True Account of Incidents that Happened Along the Old Santa Fe Trail, by William H. Ryus, 1913. William “Billy”. H. Ryus was better known as “the Second William Penn” by passengers and old settlers of the Santa Fe Trail because of his rare and exceptional knowledge of Indian traits and characteristics and his ability to trade and treat with them so tactfully. Ryus was one of the boy drivers of the a stage company with U.S. Mail contracts, regularly running along the Santa Fe Trail. During this time, he routinely crossed the plains at a time when the West was still looked upon as “wild and wooly,” and in reality, was fraught with numerous, and oftentimes, murderous dangers.